In the new year, with the support of Mikva Challenge, is launching Chicago’s first-ever Aldermanic Youth Council right here in our 35th Ward. We would like to invite 35th Ward youth leaders to be part of our Aldermanic Youth Council. 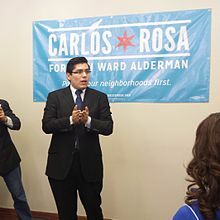 Alderman Carlos Ramirez-Rosa has partnered with Mikva Challenge – a non-partisan, non-profit organization that develops youth to be active citizens – in an effort to incorporate youth voice and participation into our 35th Ward. We are looking for passionate youth leaders who live in the 35th Ward and are: (1) eager to develop their leadership skills, (2) want to help develop solutions to issues that youth in our Ward face, and (3) want to help make decisions about how to improve our Ward. The program will run from January 2016 through June 2016. Students will meet twice per month, and receive a stipend for their time through Mikva Challenge. The deadline to apply is January 4, 2016. To apply please visit www.aldermancarlosrosa.org/youth. If you have any questions please feel free to call my office at 773.887.3772 and ask to speak to Monica Trevino.